Chef Robert "Rawbert" Reid and his kitchen staff. WHO IS IN CHARGE Robert “Rawbert” Reid’s life changed in 1994, with his sister in-law’s cancer diagnosis. That devastating moment led Reid to immerse himself in holistic medicine, hygiene, and nutrition. He soon was teaching, and thinking about opening a restaurant. A resident of Arlington, Reid first sought to open his natural-based eatery in Somerville’s Davis Square, but found the cost prohibitive. A friend recommended a spot in downtown Beverly, near the stately Cabot Theatre, and in late 1999 Reid opened his Organic Garden Café. Over the past two decades, said Reid, “Our concept has evolved. 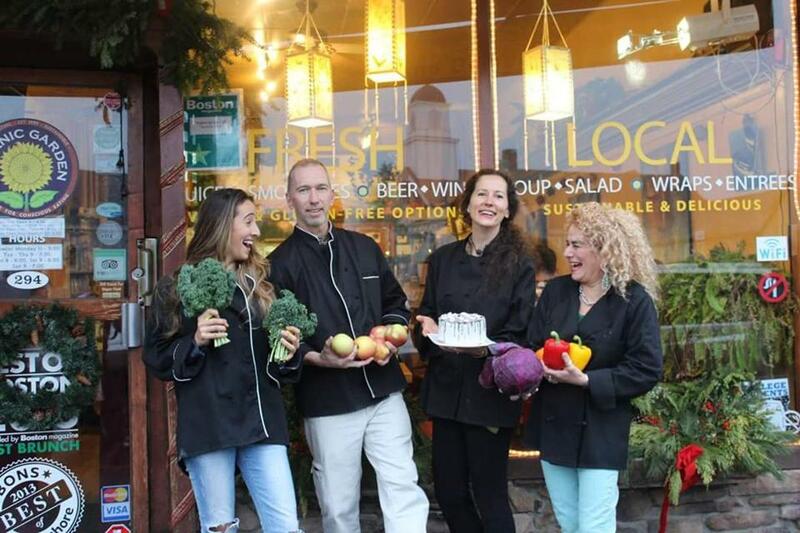 “We started out as a raw food restaurant. But five years into it, we added brown rice to the menu and our monk’s bowls became very popular. THE LOCALE This funky storefront bistro is short on elegance but long on character. The interior, brightened by yellows and mangos and murals of farmers tending their fields, also features the handiwork of local artists. The restaurant seats 30, making for a cozy environment. Keep in mind that tables along the left wall (facing the kitchen) can get chilly on cold days because of the lack of a foyer in front. The wait staff was knowledgeable and attentive without being intrusive. ON THE MENU There’s an eclectic array of raw, vegan, and vegetarian items for breakfast, lunch, and dinner. Almost everything, including most desserts, is made in house with locally sourced ingredients. Thr Thai Bowl outside the Organic Garden Cafe in Beverly. On a cold evening, my wife, Lauri, and I started with a bowl of corn chowder ($8.50). 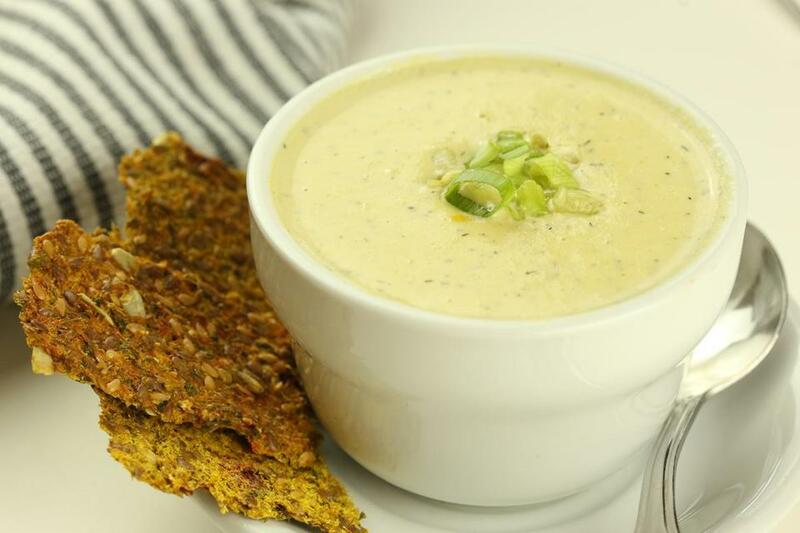 Made with almond cream and plenty of kernels, the chowder was rich and thick but without the traditional buttery consistency, a filling and fulfilling appetizer served with flax suncrackers ($1). For her entrée, Lauri ordered the Harvest Bowl ($13.75), a fun composition of spinach, shredded carrots, quinoa, bean sprouts, diced red onion, roasted butternut squash, roasted walnuts, dried cranberries, and soft curried rice cake that had a complex but pleasing flavor balanced with an intriguing mix of textures. I was tempted by the Pure Pad Thai ($14.95) from the appetizer menu, made with kelp noodles, as well as the Buffalo Tempeh Wrap ($11.95), featuring Frank’s Original Hot Sauce and a cashew-based jack “cheez.” Instead, I selected the Thai Bowl ($13.95). Like Lauri’s bowl, my dish was a splash of colors and fresh flavors, a wonderful, earthy combination of spinach, carrots, brown rice, and bean sprouts with moist chunks of sunseed burger, enhanced by a light curry sauce and sprinkled with cashews. 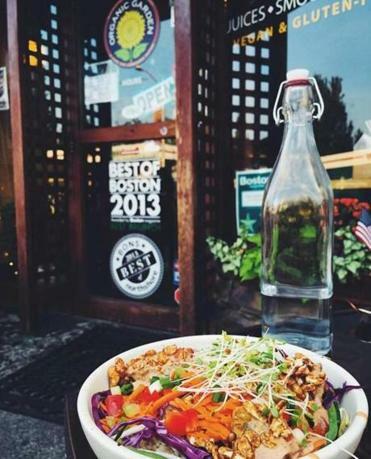 All bowls are also offered in “demi” sizes ($7.50), and can be customized with a number of additional toppings, including avocado, black beans, cheesy kale bits, various nuts, falafel, brown-rice vermicelli, and sauerkraut. Diners should also take a gander at the café’s dessert case. The four shelves are chocked full of delights ranging from chocolates to cakes, and pies to pastries. Lauri and I decided to bring home a pair of delicacies, a mocha ganache truffle and a dark chocolate hazelnut raisin bark (both $3.95) for a delicious late-night treat. Organic Garden Café, 294 Cabot St., Beverly. 978-922-0004, organicgardencafe.com. Made with almond cream and plenty of kernels, the corn chowder was rich and thick.